I was lifting a pot the other day. Had my knees bent, completely crouched and came up slowly , leaning back as I would a deadlift, but now I've aggravated the herniated disk in my lower back. I'm pretty scared of getting under a bar for squats again. My form musnt be correct and I don't want to keep hurting myself. I know people say you have to squat but I can't bring myself to do it again. I've got a fairly unusual shaped body. Like very long legs for my height, and a massive head, though that's neither here nor there. Just thought id mention it because it's just an incredibly large and amusing head. I was doing front squats for a while and never had a problem with them, but I'm worried there might be some loading on my spine there as well. Is that the case? Or is it less pressure on your spine when you do front squats? Front squats keep your back more upright but that's no guarantee. Im sure Kenny C could explain this better but if muscles fire out of sequence, such as when you set up incorrectly and don't have tention in the right places, the muscle pulls are possible. In your case, with a known back injury, the risks are greater. I expect in this latest injury, you back was rounded like in an atlas stone lift. That is a dangerous position if you're not prepared for it. I'm unsure as to whether you should be squatting. I think its worth getting a medical opinion. Yeah I've spoken with several Dr's about it and they've given me different explanations. One said if I am going to squat, use light weights and go for more reps. But if I feel any aggravation whatsoever, have a few weeks off. Another gave some fairly reasonable sounding advice by way of analogy. (I'm sure most of you guys will disagree with this). He said the human spine is not meant for such strain, even if form is correct. The proverbial paleoman would never needed to have lifted such heavy weight. A tribe would hunt together, cut up their kill and each carry pieces back together, possibly over their shoulders. That sounds pretty reasonable to me. Since I really just want to tone up a bit and lose weight, I'd be happy to be doing less weight and more reps. I just really don't want to fv(k my back any further, so I thought front squats would put a different type of pressure on the spine, since if the back is not straight, I'm just gonna drop the weight. 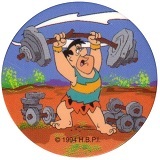 The proverbial paleoman didn't squat with heavy weight cause he didn't have a barbell. How do you perform your Back Squats? High bar should work for everyone. Otherwise just stick to Front Squats, although they are not as good overall as Back Squats are. Another hint from me is to perform 3 light sets of hyperextensions before you start a workout, this could help keeping your lower back straight at the rest of the exercises. This is an old Russian trick. ballophun wrote: Since I really just want to tone up a bit and lose weight, I'd be happy to be doing less weight and more reps. Given these goals, and the fact that you have herniated discs there's no reason to ever squat heavy again, in fact you don't need to squat period. Since you injured yourself doing a deadlift type move, you should probably avoid deadlifting too. There's so many ways to train the lower body without barbell squatting and deadlifting. Work around your injury. A lot of professional bodybuilders never squat or deadlift. People online can be really elitist about powerlifting movements, and I've been guilty of this before too, nothing is more satisfying than chasing numbers and lifting heavy to me, but don't believe this propoganda. Also don't fall for the "perfect form = never get injured" myth. So squat and deadlift if you can, but for people with chronic injuries you can get a great body sticking to safer movements too.